“In the councils of government, we must guard against the acquisition of unwarranted influence, whether sought or unsought, by the military industrial complex. The potential for the disastrous rise of misplaced power exists and will persist. We must never let the weight of this combination endanger our liberties or democratic processes. Enforcement: During a state of public health emergency, the public health authority may request assistance in enforcing orders pursuant to this Act from the public safety authority. the public safety authority may request assistance from the organized militia in enforcing the orders of the public health authority. Access to and control of facilities and property – generally.The public health authority may exercise, for such period as the state of public health emergency exists, the following powers concerning facilities, materials, roads, or public areas (‘Control of roads and public areas’). Control of health care supplies: The public health authority may purchase and distribute anti-toxins, serums, vaccines immunizing agents, antibiotics, and other pharmaceutical agents or medical supplies that it deems advisable in the interest of preparing for or controlling a public health emergency, without any additional legislative authority. Special powers during state of public health emergency, control of individuals: during a state of public health emergency, the public health authority shall use every available means to prevent the transmission of infectious disease and to ensure that all cases of infectious disease are subject to proper control and treatment. Vaccination and treatment. During a state of public health emergency the public health authority may exercise the following emergency powers over persons as necessary to address the public health emergency– To vaccinate persons as protection against infectious disease and to prevent the spread of contagious or possibly contagious disease. (a) Authorization: During the public health emergency, the public health authority may isolate (consistent with the definition of “isolation” in Section 103(h)) or quarantine (consistent with the definition of quarantine in Section 103(o)) an individual or groups of individuals. This includes individuals or groups who have not been vaccinated, treated, tested, or examined pursuant to Sections 602 and 603. The public health authority may also establish and maintain places of isolation and quarantine, and set rules and make orders. Failure to obey these rules, orders, or provisions shall constitute a misdemeanor. (1) Isolation and quarantine must be by the least restrictive means necessary to prevent the spread of a contagious or possibly contagious disease to others and may include, but are not limited to, confinement to private homes or other private and public premises. 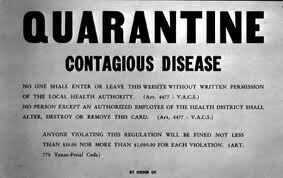 (2) Isolated individuals must be confined separately from quarantined individuals. (3) The health status of isolated and quarantined individuals must be monitored regularly to determine if they require isolation or quarantine. (4) If a quarantined individual subsequently becomes infected or is reasonably believed to have become infected with a contagious or possibly contagious disease he or she must promptly be removed to isolation. The Patriot Act, established in 2001, will also reinforce Gov’t enacted powers to the Military over the general population in the event a Martial Law style crackdown on civil liberties. ‘US Patriot Act to Be Extended Indefinitely’ – Illegal wiretapping including search & seizure is now limited to 10 years.